This morning was my first commute into the office on the Brompton. I dressed as normal in a suit, shirt and tie (but still wore my Nike walking/running shoes as I keep formal shoes at the office) and then rode in. The weather forecast was for showers and indeed a little over halfway there the drizzle started, enough to leave a trace on my Garmin and to feel it, but not really enough to make me wet, fortunately. But that does raise the question of what to wear as winter draws in: when I run, I wear clothes including waterproofs/water resistant jackets that are fine for warm, cool or cold weather. I wear a different suit every day for work, so simply leaving one at the office won’t work for me. So my choices are either to wear the suit into the office and risk getting it wet or carry one in every day and change when I get in. But how to carry the suit? I looked at some of Brompton’s luggage that clips to the block on the frame of the bike, but none really looked right as a suit bag. I already have a number of suit carriers but none would be suitable to sling over my shoulder without them falling off again or they’d be flapping in the breeze. No, a better alternative was needed, so off I went to the Internet. 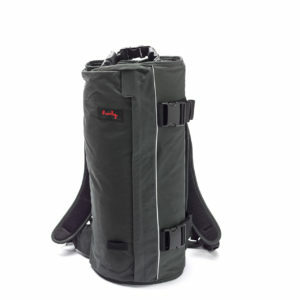 The first decent one – according to all the reviews I read – was the Henty Wingman Backpack which rolls the suit to prevent creases rather than the normal folding suit bags. In addition, some stiffeners in the bag prevent it from folding and hopefully leave the suit and shirt crease-free. 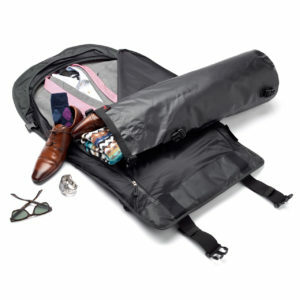 The garment bag takes a suit and a couple of shirts max and is zipped up and a second roll bag then clips in front of it, intended to take your shoes and toiletries, etc. before the whole lot gets rolled up. I preferred the backpack design to the messenger bag version. I’ll probably just use the roll bag for waterproofs and additional layers, I expect, plus my wallet, although that can go in the outside pocket. So I’ve ordered one to pick up today and try out tomorrow. And here’s today’s ride. I forgot to set the Garmin off early enough so it took a few metres until it had located me, so it was actually slightly longer.